Perth is a very appealing city if you like blue skies, great beaches and friendly people. Indeed it is the sunniest city in Australia with 3’200 hours annually and temperatures in the summer are in the mid to high 20s range (celsius), while the sky is rarely stained with any clouds at all. It’s not just the amazing weather – there is also the great landscapes, long beaches, and river banks with easy access. The Swan river divides the city into the more urban northern part and the more residential south and there is a long stretch of beautiful, wide, sandy beaches. Finally, Perth is a windy city. The West Australian coastline has a strong seabreeze system from November to February. The breeze is thermally-driven and usually starts just after midday and lasts until the sun sets. On some days a few extra knots of wind kick in around 4pm. Wind speeds are usually over 20 knots with a steady – almost constant – blast. Most people use 8m2 and 10m2 kites and larger kites are usually not required. 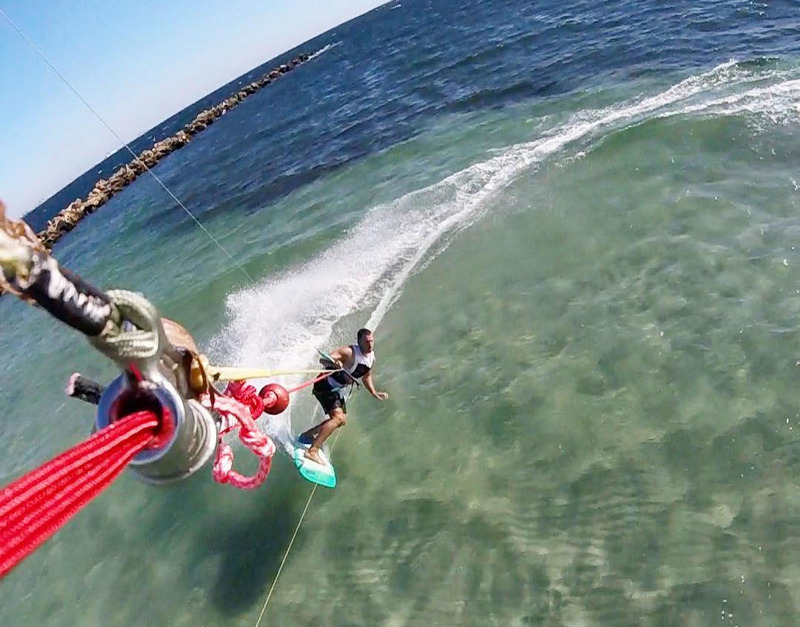 Most kiters wear a thin wetsuit, but it’s not a must if you’re not too sensitive. There is a wide range of available sites for wave riding as well as flat-water lagoons, perfect for twintip boards and free-style, with beautiful surroundings. I can’t think of another large city with comparable conditions for kitesurfing and other watersports. As a result many locals practice kitesurfing regularly here – the spots get busier on weekends and after work on weekdays. There is no denying the presence of sharks in Western Australia waters. If you are paranoid about this risk, then choose another kitesurfing destination. However, the number of actual attacks is very low and other activities we regularly do (such as driving a car) are more likely to result in injury. In 2015 there were two non-fatal shark attacks in WA, while in 2016 there have been five (of which two fatal). By comparison, there are 50-60 road fatalities each year with hundreds more injured. The shark-risk is actually quite small, especially if you consider the number of beach goers, surfers and kiters in the ocean every day. Indeed since 2013 selfie deaths outnumber deaths from shark attacks in Australia. I have judged the risks relatively insignificant and went to explore the coast, seeking out four great spots. A video on he bottom of this post provides a quick overview of the four spots. Leighton Beach (sometimes also called “The Dutchies” or Mosman beach) is the stretch of beach around North Fremantle Station. To the south there is the Fremantle Port whose cranes can be seen in the distance, while to north there is another similar beach called Cottesloe. 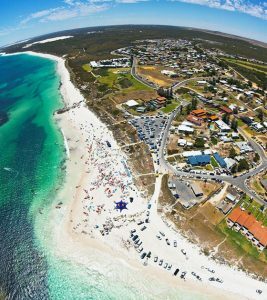 Cottesloe beach is popular amongst Perth residents for swimming, sunbathing, family picnics, beachside meals as well as watching sunsets. 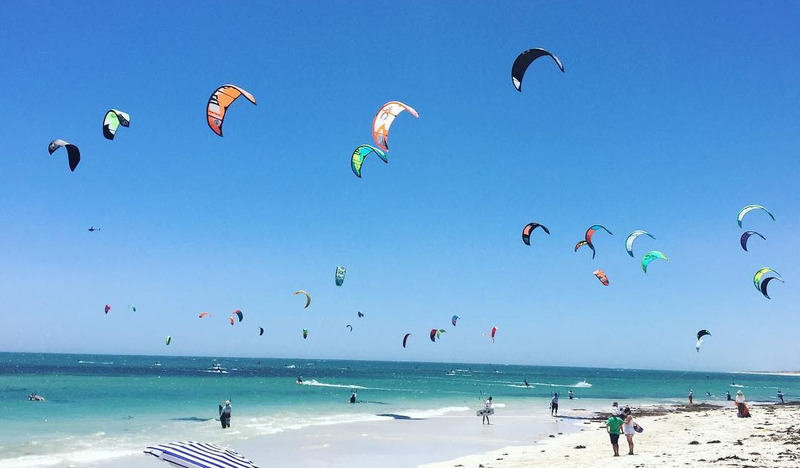 Leighton Beach is a popular kitesurfing spot, but its clear waters and consistent waves also attract swimmers, body boarders, surfers and beachgoers with dogs who come to stroll here. 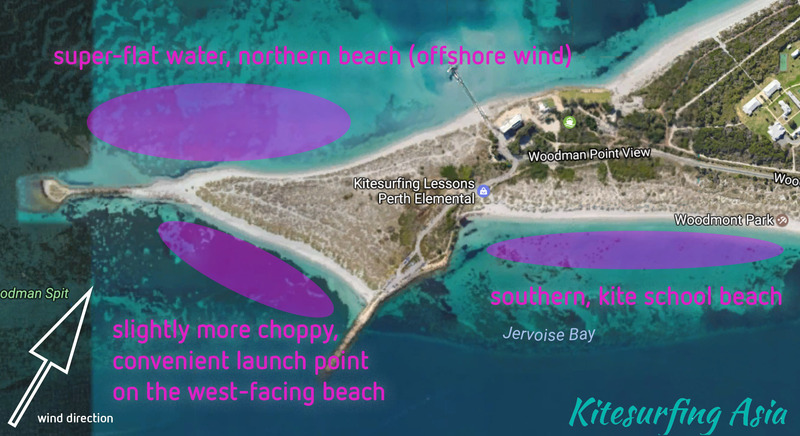 However the beach is wide and not too crowded and there is plenty of space to setup your kite and lines. You’re kiting in the ocean, so the water is choppy but the waves are not very high and roll in rather gently – just big enough to have some fun. It’s not a spot for beginners (it gets deep and is a bit choppy), but neither is it a difficult spot. It is convenient and easily accesible from the city and relatively spacious. There is free and plentiful parking along Curtin avenue and you could even come by public transportation (the Fremantle line). Melville is even closer to the city center than Leighton. Melville is part of an upscale residential area, with more than a few expensive houses overlooking the Swan river. In this area the swan river is lake-like and you won’t feel the current while the water is still. It’s also shallow, making it a good location for learning (I believe several local schools teach here). Given the flat water surface it’s a perfect place for pulling some jumps on your twintip board while admiring the city views. There is free parking available along Melville Beach Road, and you can setup your kite a few meters away from your car by the water on the narrow strip of beach separating the road and the river. This location does get busy on windy days around 6pm as people come after work. The wind tends to be a bit more gusty than the seaside locations as you are more inland. Given the proximity to the city and convenient beach access from the car with a slightly different surrounding environment, this sweet-water spot is a good option. Woodman Point is a small peninsula about 8 kilometers South of Fremantle – a charming and funky part of Perth with a bohemian vibe. If you are coming to kite at Woodman point, you will probably need your own transportation. The spot is about 1-2 kilometers from the main road – so maybe too long a walk from the bus stop. The great thing about Woodie is that it actually has three different beaches facing south, west and north – all within a short walking distance. The beach facing south is mostly used by beginners and kitesurfing schools to teach. The beach in the middle facing west is a convenient launching point, and you could easily just stay there for a session. All three beaches are protected from waves by Garden Island, but it is the third, north-facing beach, that has super-flat water. It also a local pro-rider spot which is obvious on most windy days as you are able to admire some truly sick tricks. 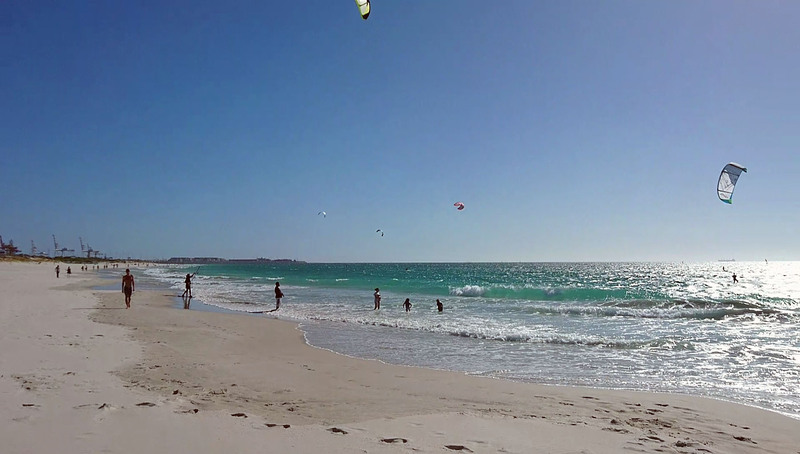 Lancelin is not in Perth – it is a town two hours north. 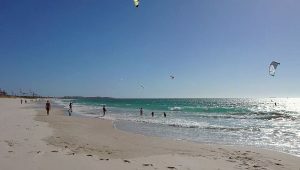 During our stay, it became apparent that the very best spots of Western Australia are actually north of Perth, and Lancelin is without a doubt one of them. After arriving from Perth, this small town was a welcome change – it felt very provincial. Indeed it only has a population of 500 or so. The spot is located at a large lagoon with crystal clear azure blue butter-flat water, and you also have the possibility of venturing out into the wave break. I suppose the only reasonable way of getting to Lancelin is by car, however once here, you cold do without your own transportation, as the town is quite small enough to walk around. Obviously activities outside of kitesurfing are more limited than in WA’s capital. 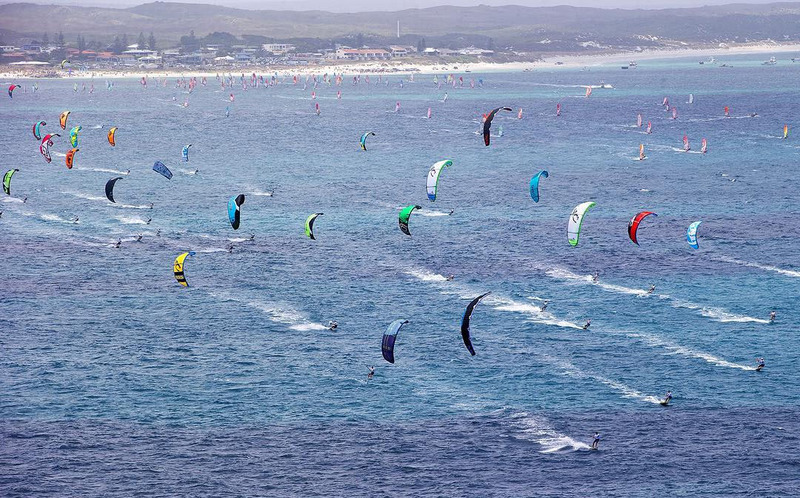 On the other hand you will find some like-minded kiters here, and even more so on week-ends when people from Perth make a trip for some truly amazing kiting!